The Palomino model has 3 Beds and 2 Baths. This 1542 square foot Double Wide home is available for delivery in Arizona, California, Nevada, New Mexico, Colorado, Utah. If the most important room in your dream home is a very large and ultra-swanky master bathroom, then you’ll adore the Palomino. And, if having a full-sized kitchen that includes an island dinette, pantry and tons of countertop space appeals to you, then you may just want to make an appointment to tour this split floor double wide soon! 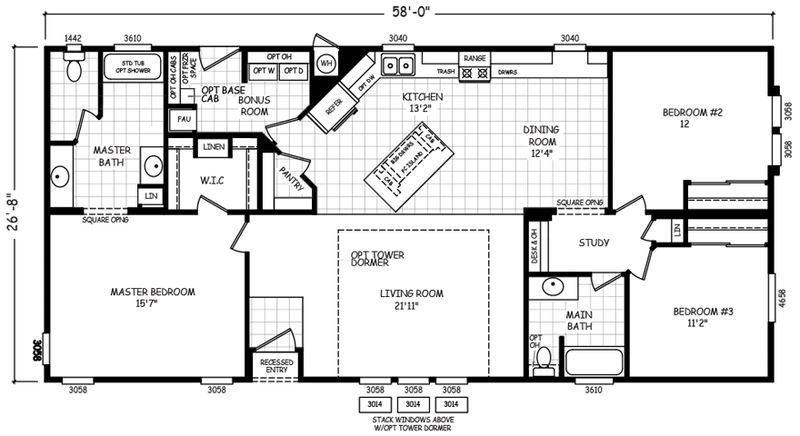 Ask about the optional tower dormer, washer/dryer and overhead cabinetry throughout. If pictures are shown, they may depict upgrades and options that are not included within the base price of the home. Ask your housing consultant for details about the other great features that come standard on the Palomino manufactured home.